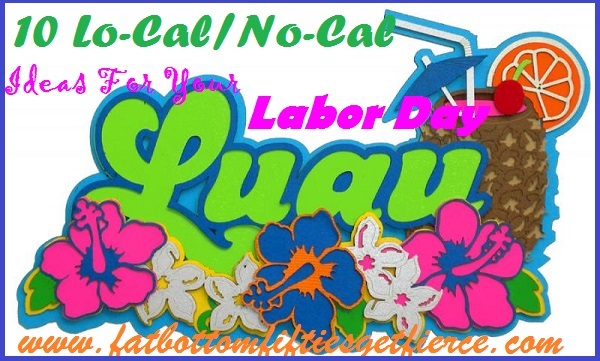 Celebrate the end of summer with a non-traditional Labor Day Luau*. Bright colors, tasty treats and flowing flowers stretch your summer through the first weekend of September without messing with the summer body you worked so hard to get. So trade in those ordinary hot dogs and burgers for some tropical delight! 3. Tropical cucumber salad. A tasty way to stay hydrated while playing in the sun! 4. Hoola Hoop Contest. Nothing says Luau better than dancing the hula – but since most of us have never taken a lesson from a reputable halau, a hula hoop contest is a good comprise. No need to break it down into age groups – just three at a time and winner advances to final round. Way to get moving in between courses! 5. Coconut bowling: Who doesn’t love bowling?!? Kind of like bocce balls go Hawaiian. Pick up some coconuts at your local grocery store, dress up a few water bottles with palm tree cutouts, clear a few lanes, and ‘strike’ a pose. 6. Pineapple Cream Cheese Walnut Dip: Light cream cheese loaded with veggies and fruit and topped with some healthy walnuts – grabbing some ‘healthy’ just isn’t hard to do! 7. Pina Colada on a stick. Coconut, pineapple and strawberries – mmmmmm – an island delight! 10. Laua Lanterns: OMG! These lanterns made with cocktail umbrellas are toooo fun. I need to get started constructing my lanterns for my next luau-themed party. These ROCK. Check out the video for instructions on creating. * NOTE: M lived in Hawaii for years, and each of the ideas in this collaborative effort have been M approved!